Simple instrumentation for an uncomplicated surgical technique: Ream, Broach, Insert and Compress. 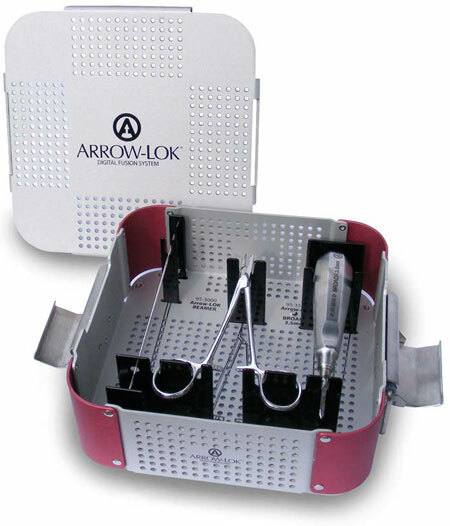 The ARROW-LOK™ Digital Fusion System is simple, easy, and effective. Smooth trocar tip that creates a pilot hole without removing bone. 5mm graduations from the tip serve as a depth gauge for reamer insertion. Advancing the reamer may also provide the surgeon with an initial indication of the patient’s relative bone quality. Inserted into the pilot hole created by the reamer, the broach forms a channel in the intramedullary canal that conforms to the shape of the 3-dimensional arrowhead tip of the ARROW-LOK implant. Conserves bone by compacting the cancellous bone of the phalanx to enhance the engagement of the ARROW-LOK implant’s arrowhead tip upon implantation. 2.7mm width creates 0.8mm of press-fit for the 3.5mm diameter arrowhead. Firmly grasps the ARROW-LOK implant preventing both rotation and translation to ensure the implant is placed securely in the broached pilot hole. Cannulated to hold the implant securely. Provides a positive stop to prevent the implant from translating when placing the intermediate phalanx over the implant. Able to grasp the implant at the position determined by the surgeon to place the implant in the best position in relation to the fusion site. Surgeons have the freedom to place the implant where they believe it is best positioned and are unrestricted by either implant or instrument design. Slender tip minimizes the translation when compressing the two bones to the final locked position following disengagement of the insertion forceps.